Located in the heart of Lake Harmony, Pennsylvania & the beautiful Pocono Mountains! 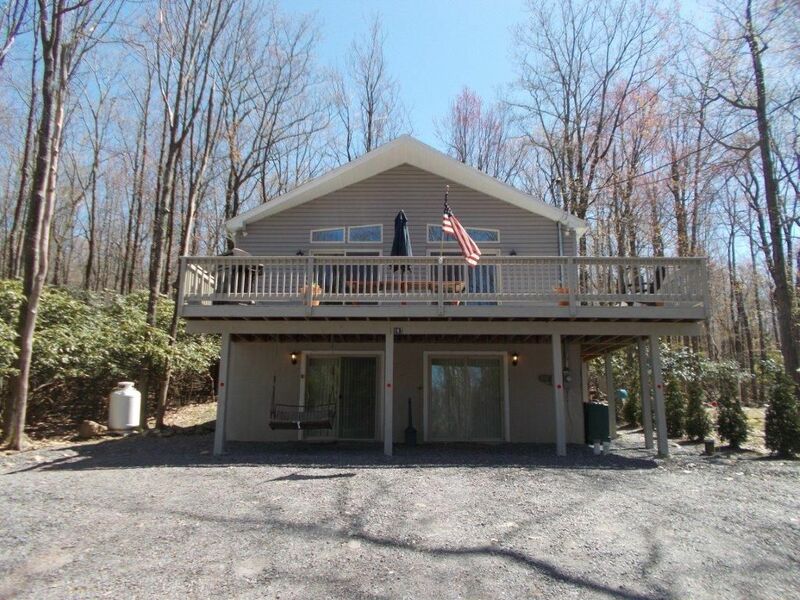 This beautiful, newly built, chalet style home offers a birds eye view of lake harmony. Located between Split Rock & Jack Frost Ski Resorts, you have your choice of 2 great ski areas with restaurants & shopping! Enjoy cozy evenings in front of the fireplace, while the family plays a game of pool or takes in a movie on the large flat screen TV in the downstairs living room! In the spring & summer, amenities abound with white water rafting, biking along the Lehigh River Gorge to Jim Thorpe, long walks in Lake Harmony Estates & outdoor grilling/ star gazing on the large deck & roasting marshmellos in the fire pit out back! Fully stocked kitchen, outdoor grill, canoe & lake access. Take long walks, drive to nearby Boulder Field, Enjoy cozy evenings w/the warmth of 2 gas fireplaces. The water park at Split Rock Resort is nearby. This property is not located in Lake Harmony Estates and does not have access to the private lakefront beach owned by the Estates. All new bed mattresses (8) November 2106. New sleep sofa & matching love seat in upstairs living room November 2016. New leather sofa & 2 love seats in lower living room November 2016. 2 full baths on the upper level. 3rd bathroom on the lower level near 2 full sized bedrooms. Beautiful upstairs living room w/open concept. 2 large sliding glass doors w/trapezoid windows above provide beautiful light & views! Large lower level living room for entertaining! Bed Linens and Towels are Not Provided (sheets & pillow cases) - Linen Service Optional ($100.00) and Towel Service is $5.00/set. Just as advertised! Beautiful home and David is extremely helpful! Will definitely stay here again! My stay at David's home was great! Everyone had a great time and enjoyed everything the home has to offer. Modern, spacious, and comy;no complaints whatsoever. Thanks again, David! Our family had a great time. House was great. The owner David was very fast at replying with any questions we had. We loved sitting out back by the fire and roasting marshmallows with the deer. I would highly recommend. We all had a wonderful time at David's home. The pool table and fire pit were a big hit. David was very accommodating and quick to respond to any questions we had. Just perfect !! For families and groups !! It was very nice house..
Nestled in the Pocono Mountains of Pennsylvania. Lake Harmony & Split Rock Resort boast festivals throughout the year including 'The Taste of Pennsylvania Wine Festival Jazz Fest, & Nascar racing just miles away at Pocono 500. Biking, hunting, fishing, boating, mini golf, tennis, & many other resort amenities including 'mountain massages'. Skiing & snow tubing in the winter.